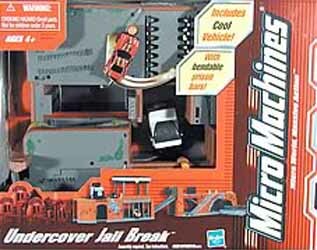 The Undercover Jail Break playset features: bendable prison bars, breakable brick wall, collapsing road, helicopter pad, vehicle trap and a working elevator. 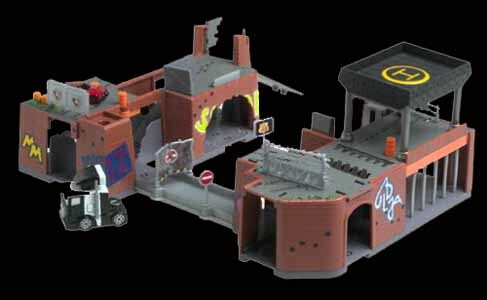 This playset can be used on its own, or linked to one of the other Micro World playsets in the range. While this set comes in a fairly compact box, once you have everything laid out, it takes up quite some room and there is plenty to keep kids entertained. While this comes equipped with a cool car you can use any of your Micro Machines in this set - guaranteeing hours of fun. While some of the components of this playset were a little flimsy, it is still possibly the most durable in the range - although we did have a problem with some of the bits - which would keep falling off. Otherwise, this is an extremely entertaining playset.